The athlete who stood out from the crowd, for me, was Dana Abdul Razak, from Iraq. I noticed her during the Opening Ceremony’s Procession of Athletes. I had to research to learn why I was so touched by her presence. Photo taken on Aug. 21, 2008 shows Iraqi athlete Dana Hussein Abdulrazak hold a Chinese knot in Beijing, China. Iraqi women runner Dana Abdul-Razzaq has received as loud applause as champions. The Iraqi team’s only woman faced many obstacles to reach Beijing, from a sniper’s bullets to a lack of training facilities and religious and cultural opposition to female athletes. 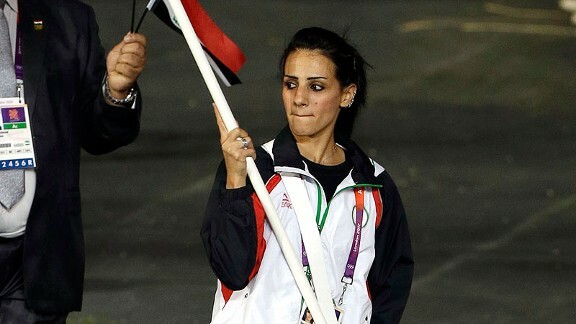 Dana Abdul Razak was one of few females granted the honor of carrying her country’s flag into the Olympic stadium in the London 2012 Olympics. 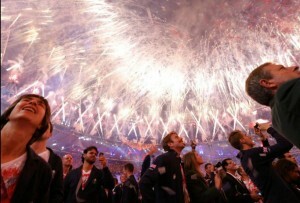 It is stories like Dana’s that make the Olympics worthwhile!